Oil and gas will remain “significant elements” of Ireland’s energy supply into the future, the Minister of State for Natural Resources said at an industry conference yesterday. Opening the ninth annual Atlantic Ireland Conference, Sean Kyne, TD said that Ireland must walk a fine line to balance the “competing aspects of competitiveness, security of supply and sustainability” of our energy needs. The annual conference is organised by the Irish Shelf Petroleum Study Group (ISPSG) and is a key event for the Irish oil and gas exploration sector. The ISPSG Group was set up in 2002 by the Government’s Petroleum Affairs Division (PAD) and includes representatives from companies such as Chevron, Shell, Total and Statoil. In line with the goals of the Paris Agreement agreed in 2015, Minister Kyne said that Ireland is “committed to the transformation required to achieve a low carbon and climate resilient future”. However, he warned that this “will not take place over night” and that oil and natural gas will “remain significant elements of Ireland’s energy supply in the transition period” toward an increased use of more renewables, such as wind and solar. According to Minister Kyne, the Government sees the potential for Ireland’s offshore oil and gas resources to “deliver significant benefits to the people of Ireland in terms of security of supply, import substitution, and fiscal return”. In this light, Mr Kyne said that the government is “actively supporting” research projects, updating Ireland’s regulatory and fiscal frameworks and providing “cost-effective” entry licensing schemes. According to Deputy Thomas Pringle, however, Ireland should be looking to move away from investment in fossil fuels “now more than ever”. The Independent Donegal TD has brought forward the Irish Fossil Fuel Divestment Bill which aims to make Ireland the first state to ban a state investment vehicle from investing in fossil fuels. If passed, the Bill will compel the Ireland Strategic Investment Fund (ISIF) to divest its assets from fossil fuel companies over a period of five years. The ISIF has currently invested 131 million in fossil fuel companies globally. “We’re so far behind in responding to climate change we’re going backward,” Mr Pringle told The Green News. “At this stage, we should be getting firm commitments from Government to remove itself from fossil fuels including support for legislation such as my Fossil Fuel Divestment Bill currently progressing through the Oireachtas. When it comes to climate change, nothing less is acceptable”. Green Party Senator, Grace O’Sullivan said that Minister Kyne’s comments highlight “how shallow the Government’s commitment to greening our country and our economy really is”. “Either we actually plan to meet our international commitments, protect our marine environment and get off needlessly destructive, polluting and wasteful fossil fuels, or we do not,” she added. Although 25 per cent of Ireland’s electricity was generated from renewable sources in 2015, Ireland currently relies heavily on imported oil and gas from Moffat in Scotland and Russia for our heating needs. There is a gas supply from the Kinsale and the Corrib field, however, both are expected to face critical production issues by 2025. Speaking at the Citizens’ Assembly meeting on Climate Change last month, Dr Brian Motherway of the International Energy Agency said that the Irish Government is “giving our money away” through its dependence on imported fossil fuels. Dr Motherway estimated that within the space of his 20-minute presentation, the State would have spent a quarter of a million euro on importing “other people’s expensive polluting energy” such as oil from the Middle East. 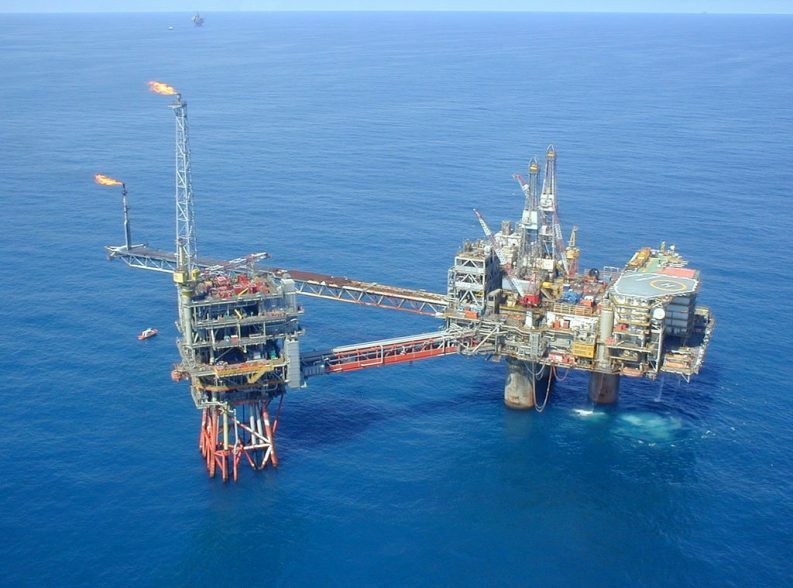 In July, Providence Resources began drilling in Porcupine Basin, 220km off the southwest coast, in search of an estimated five billion barrels of oil. 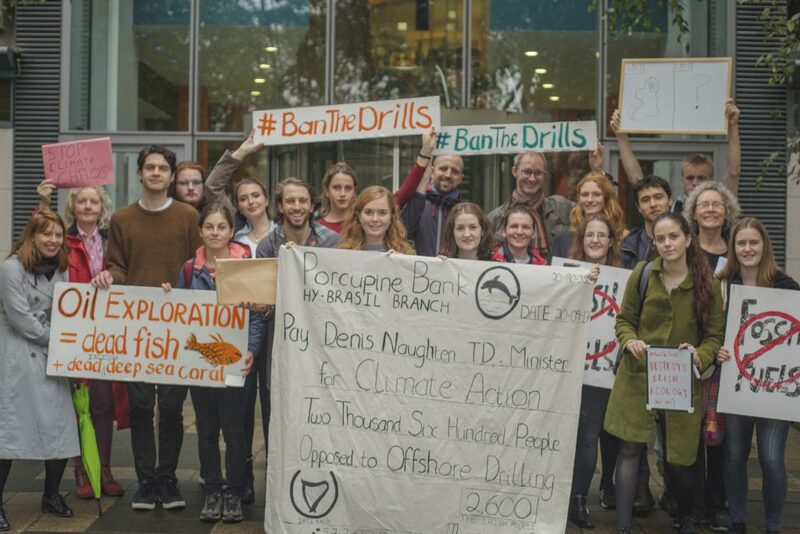 Drilling in the Porcupine Basin began on 11th July, just one week after a Bill to ban onshore fracking in Ireland was signed into law by President Michael D Higgins. The first of its two wells, Druid, was revealed as a water-containing reservoir in early August. Soon after, Providence announced the poor results for the deeper Drombeg well with the market taking notes as stocks dropped by 16 per cent in Dublin and almost 30 per cent in London. Consent for the project in the Porcupine Basin was granted by Minister Kyne, who said that the drilling operation offered the potential benefits of an “enhanced security supply and reduced fossil fuel imports”. Members of the grassroots environmental campaign group Not Here, Not Anywhere gathered outside the office of the Minister of the Environment in September to voice concern at the decision to grant consent for oil & gas drilling in the Porcupine Basin. The group presented Minister Naughten with a novelty cheque on behalf of 2,600 people of Ireland who signed a petition calling on him to “represent those who elected him, not the big money of the oil industry”.